Portugal is perhaps the least well known country in Western Europe. And the language? My gosh, it gets me every time. I'll hear a Spanish word, my ears will perk up in recognition... and then my mind will be blown by the unfamiliar sounds that follow. I literally had no idea what to expect from the small sliver of Portuguese culture that shares the Iberian peninsula with the pride of Spain. Well, except that their food is really good. What brought me to Portugal then? Good friends. Sixteen years ago, in my family's first home, a Portuguese family moved into the house across the street. My mom became best friends with the mother, my brother, with the son. Although there wasn't a friend for me, their eldest daughter took me to my very first concert: N'Sync at Macy's in Herald Square. Don't worry, I'm still cool and have the signed passes to prove it. But in 1999, they moved. For the past 10 years, they've been living in a small Portuguese city in between Porto and Lisbon. They invited me to visit as soon as I arrived in Paris. So, for spring break, I planned an 8-day trip in which I flew into Porto and out of Lisbon, planning to spend a weekend with them in between. I explored much of the city on my first day in Porto (see photos here), venturing from the Crystal Palace Gardens all the way Saõ Bento station. And on my second day, I sought out the port wine cellars. 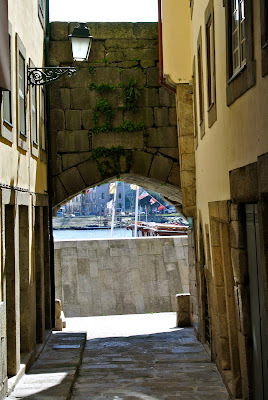 I walked down to the Ribeira and crossed the bridge over the Gaia to Vila Nova de Gaia to do just that. Then, upon arrival, I realized I hadn't had lunch yet. It was 2pm. I stopped into the first restaurant I saw: D. Tonho, situated in a glass box of a building with fantastic views of Porto across the river. The friendly waiter served me water, bread, and butter (all of which I'd later be charged for, as is customary in Portugal). For my meal, I ordered a mixed green salad, glass of white wine, and the chef's suggestion: salted cod with potatoes. It was phenomenal, infinitely more flavorful than the last time I'd had cod (in London). There was olive oil, slices of yellow onion, bits of hard-boiled eggs, a handful of green olives, and fresh parley in addition to it and the potatoes. The side of broccoli and dry white wine were pretty enjoyable as well. But the cod! Phenomenal, I tell you. It's no wonder there are so many Portuguese recipes centered around it. And for dessert, port wine. The last time I tasted it, I was a college senior wine touring by Cayuga Lake. I don't recall liking it at all. 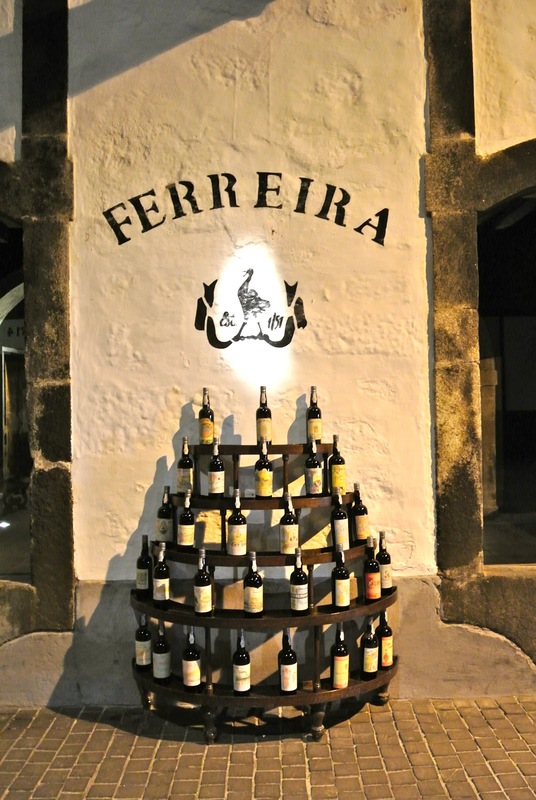 I was eager to find out if my tastes had matured and decided upon Ferreira, the only Porto wine house to have remained under Portuguese ownership since its founding in 1751. Of all the fun facts I learned about port wine during the tour of the Ferreira cellars, the most memorable was about its origins. In the late 17th century, the British began importing port wine. The trouble was, by the time the wine was produced inland in the Duoro Valley, transported in barrels by barcos rabelos , aged, blended and bottled in Vila Nova de Gaia, and then transported to England, the wine had spoiled. Fortunately, somebody soon discovered that adding a bit of brandy preserved the wine. And as such, the distinctly sweet and fortified port wine became the port wine we know today. I must admit I'm still not a fan though. The white port wine--which our guide suggested be served as an aperitif--was too sweet for me. As for the tawny, which I am much more familiar with as the quintessential "port wine", I found the brandy flavor too strong; even if a chocolate pairing does sound divine. 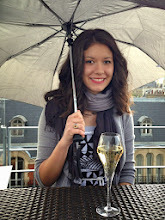 As much as I enjoyed the experience, my distaste for port wine kept me from visiting the other cellars. Instead, I ventured back across the bridge and into a classic Portuguese pasteleria. There was literally one on every corner of every street in Porto, sometimes two, and I found the same to be true as I saw more of Portugal. Each had a similar variety of pastries and breads. A cup of coffee and a pastel de nata quickly became my favorite afternoon snack. And with that sweet thought, it's time for tea in Paris. Be back soon! Aww, you made me miss Portugal so much! Seems like you had a fabulous time though! Porto is such an amazing city! I did have a fabulous time! It's a shame I got sick for some of it though. I didn't get enjoy as much Bacalhau à Brás as I would've liked! Argh! Just saw your "I'm going to the Hive" buttton! Yeay! Me, too! How exciting!! It is, it is. And isn't that surprising?! It's not at all the romantic history I expected. The Portuguese tarts exceeded my expectations as well, but in a different way :) see you in Berlin! I can hardly wait.